Such events,of course, have been fixture of our modern history that goes back to the early 1960s when a good number of Filipinos, in the academe, press and Congress started a rebirth of nationalism, born out of their awareness and knowledge of the errors and hidden truths in our official,mostly popularized written history, and economic agreements that only stunted national economic development and perpetuated a mendicant leadership. I remember back then when a few concerned individuals addressed the protests in our streets. There was Fr. Vitaliano Gorospe, SJ who wrote a pamphlet about the morality of demonstrations while Professor Renato Constantino wrote an essay explaining to both parents and students activists all about protesting/dissenting. At the time, if not a bit earlier, Associate Justice (US Supreme Court) William O. Douglas wrote a booklet on the subject of protest and dissent, which were in ferment in America (and was relevant to our copycat republic). However, let us not get carried away and be confused about the American way, which recognizes that protests may even be patriotic. In our homeland, then and now, where truly populist dissent and political activism--not of the fad variety-- are a risky business; where respect for activists' human and constitutional rights and lives are less recognized; and where such protestors are violently suppressed and in certain cases, assassinated. What follows are excerpts from his published booklet entitled "Points of Rebellion." Note that Justice Douglas even mentioned a " much needed revolution...in the Philippines." The continuing episodes of protest and dissent in the United States have their basis in the First Amendment to the Constitution, a great safety valve that is lacking in most other nations of the world. The First Amendment creates a sanctuary around the citizen's beliefs. His ideas, his conscience, his convictions are his own concern, not the government's. After an American has been in a totalitarian country for several months, he is greatly relieved when he reaches home. He feels that bonds have been released and that he is free. He can speak above a whisper, and he walks relaxed and unguarded as though he were no longer being followed. After a recent trip I said to a neighbor, "It's wonderful to be back in a nation where even a riot may be tolerated." All dissenters are protected by the First Amendment. A "communist" can be prosecuted for actions against society, but not for expressing his views as to what the world order should be. Although television and radio time as well as newspaper space is available to the affluent members of this society to disseminate their views, most people cannot afford that space. Hence, the means of protest, and the customary manner of dissent in America, from the days of the American Revolution, has been pamphleteering. Other methods of expression, however, are also protected by the First Amendment- from picketing, to marching on the city streets, to walking to the State Capital or to Congress, to assembling in parks and the like. It was historically the practice of state police to use such labels as "breach of the peace" or "disorderly conduct" to break up groups of minorities who were protesting in these unorthodox ways. The real crime of the dissenters was that they were out of favor with the Establishment, and breach of the peace or disorderly conduct was used merely as a cloak to conceal the true nature of the prosecution. In 1931 the Supreme Court, in an opinion by Chief Justice Charles Evans Hughes, held that the First Amendment was applicable to the States by reason of the Due Process Clause of the Fourteenth Amendment. That Clause provides that no State shall deny any person "liberty" without "due process." The Hughes Court held that the right to dissent, protest, and march for that purpose was within the purview of the First Amendment. Breach of the peace and disorderly conduct could, therefore, no longer be used as an excuse for the prosecution of minorities. Parades, of course, can be regulated to avoid traffic problems and to allow for easy access to public offices by other people. Pickets may be regulated as to numbers and times and places. But the basic right of public protest may not be abridged. While violence is not protected by the Constitution, lawful conduct, such as marching and picketing, often boils over into unlawful conduct because people are emotional, not rational, beings. So are the police; and very often they arrest the wrong people. For the police are an arm of the Establishment and view protesters with suspicion. Yet American protesters need not be submissive. A speaker who resists arrest is acting as a free man. The police do not have carte blanche to interfere with his freedom. They do not have the license to arrest at will or to silence people at will. This is one of the many instances showing how the Constitution was designed to keep government off the backs of the people. Military strategy has indeed become dominant in our thinking; and the dominance of the military attitude has had a sad effect at home. There have always been grievances and youth has always been the agitator. 3 ) It is led by the young people who, though not unanimous in tactics or in objectives, have given these protests a revolutionary tone. The goal of their revolution is not to destroy the regime of technology. It is to make the existing system more human, to make the machine subservient to man, to allow for the flowering of a society where all the idiosyncrasies of man can be honored and respected. The interests of the corporation state are to convert all the riches of the earth into dollars. Its techniques, fashioned mainly on Madison Avenue and followed in Washington, D. C., are to produce climates of conformity that make any competing idea practically un-American. The older generation has in the main become mindless when it comes to criticism of the system. For it, perpetuation of the corporation state and its glorification represent the true Americanism. "If only the world were like us, everything would be perfect." The First Amendment was designed so as to permit a flowering of man and his idiosyncrasies, but we have greatly diluted it. Although the Amendment says that Congress shall make "no law" abridging freedom of speech and press, this has been construed to mean that Congress may make "some laws" that abridge that freedom. A person may not be punished for believing a so-called noxious or communist doctrine; but he may be punished for being an "active" advocate of that ideology. A person may not be prosecuted for reading or teaching Karl Marx; but he may be sent to prison for "conspiring" with others to conduct classes or seminars on the Marxist creed. A person may be convicted for making a speech or for pamphleteering if a judge rules ex post facto that the speaker or publisher created a "clear and present danger" that his forbidden or revolutionary thesis would be accepted by at least some of the audience. A person may be convicted of publishing a book if the highest Court, in time, decides that the book has no "socially redeeming value." In these and in many other respects we have fostered a climate of conformity. Our colleges and universities reflect primarily the interests of the Establishment and the status quo. Heavy infiltration of CIA funds has stilled critical thought in some areas. The use of Pentagon funds for classified research has developed enclaves within our universities for favored professors, excluding research participation by students. The Pentagon now has, for example, contracts with forty-eight universities for research on how to make birds useful in aerial photography, gunnery, steering of missiles, detection of mines, and search-and-destroy operations. The University of California has been up to its ears in research on nuclear explosives with huge grants from the Atomic Energy Commission. MIT and Johns Hopkins-in terms of the dollar volume of their contracts-have been among the hundred major military-aerospace corporations. Stanford, Columbia, and Michigan have been rich with defense contracts. And so the list grows. Only revolutionary-minded faculties would provide a curriculum relevant to either domestic or foreign political problems. Very few faculty members have a revolutionary fervor or insight. It seems probable that we are entering a post industrial age in which the issue is not how to produce or even distribute goods, but how to live human lives, not how to strengthen and enrich the nation state, but how to make the world a decent habitation for mankind. The causes of the present unrest among students are of course very complicated, but one of them is a feeling among young people that contemporary institutions, and particularly the university, cannot in their present form deal with the dangers and opportunities of the coming age. The dangers are obvious enough, and the opportunities, though less often referred to, are equally great. The chance is there to have what Julian Huxley has called the 'fulfillment society' and what others have called the learning society, or simply a human society. We have no very clear conception of what such a society would be like. But we have all learned from 1984 and Brave New World what some other possibilities are. Big Brother in the form of an increasingly powerful government and in an increasingly powerful private sector will pile the records high with reasons why privacy should give way to national security, to law and order, to efficiency of operations, to scientific advancement, and the like. The cause of privacy will be won or lost essentially in legislative halls and in constitutional assemblies. If it is won, this pluralistic society of ours will experience a spiritual renewal. If it is lost we will have written our own prescription for mediocrity and conformity. The tendency of these mounting invasions of privacy is the creation of a creeping conformity that makes us timid in our thinking at a time when the problems which envelop us demand bold and adventuresome attitudes. Electronic surveillance, as well as old-fashioned wire tapping, has brought Big Brother closer to everyone and has produced a like leveling effect. In 1968 Congress made wiretapping and electronic surveillance lawful provided it was done with a warrant, as provided in the Fourth Amendment, issued by a judge on a showing of probable cause that certain specified crimes had been or were being committed. Exempted altogether from any supervision were national security cases where the President was given large authority to proceed against suspected spies and subversives. But the Administration soon broadened that category to include domestic groups who attempt to use unlawful means to "attack the existing structure of government." The Wall Street Journal sounded the alarm that such broad surveillance "could lead to the harassment of lawful dissenters." And the New York Times, in reply to the claim that Presidential power extends to surveillance of groups which threaten the government, observed that that was the theory behind the oppressive search warrants authorized by George III and they were the reason we got the Fourth Amendment. The FBI and the CIA are the most notorious offenders, but lesser lights also participate: Every phone in every federal or state agency is suspect. Every conference room in government buildings is assumed to be bugged. Every Embassy phone is an open transmitter. Certain hotels in Washington have allotments of rooms that are wired for sound and even contain two-way mirrors, so that the occupants can be taped or filmed. It is safe to assume that in the federal capital, as well as in each state capital, there is no such thing as secret classified information. The leveling effect of the numerous influences I have discussed is appalling. The tense and perilous times in which we live demand an invigorating dialogue. Yet we seem largely incapable of conducting one because of the growing rightist tendencies in the nation that demand conformity-or else. We are inhibited when we should be unrestrained. We are hesitant when we should be bold. It is not enough to be anti-communist. We need the irrepressible urge to rejoin the human race. We need to contribute moral and political leadership-as well as technical and financial help-to rebuilding a new world order controlled by Law rather than by Force. This, in summary, is the mood in which America has viewed the forces of real "revolution" that have been sweeping the nation. But what about the forces of dissent? There are many facets to that problem, but they all lead, I think, to what has been called "the diminished man." There is more knowledge and information than ever before: the experts have so multiplied that man has a new sense of impotence; man is indeed about to be delivered over to them. Man is about to be an automaton; he is identifiable only in the computer. As a person of worth and creativity, as a being with an infinite potential, he retreats and battles the forces that make him inhuman. The dissent we witness is a reaffirmation of faith in man; it is protest against living under rules and prejudices and attitudes that produce the extremes of wealth and poverty and that make us dedicated to the destruction of people through arms, bombs, and gases, and that prepare us to think alike and be submissive objects for the regime of the computer. The dissent we witness is a protest against the belittling of man, against his debasement, against a society that makes "lawful" the exploitation of humans. This period of dissent based on belief in man will indeed be our great renaissance. Students in West Germany are denouncing NATO because NATO is supposed to defend freedom, yet Greece, a cruel dictatorship, is a member. German students are inflamed at our use of napalm in Vietnam, putting to us the embarrassing question, "It's a war crime, isn't it?" There is I believe , a common suspicion among youth around the world that the design for living, fashioned for them by their politically bankrupt elders, destines them either to the nuclear incinerator or to a life filled with a constant fear of it. The Pentagon has a fantastic budget that enables it to dream of putting down the much-needed revolutions which will arise in Peru, in the Philippines, and in other benighted countries. Where is the force that will restrain the Pentagon? Would a President dare face it down? The strength of a center of power like the Pentagon is measured in part by the billions of dollars it commands. Its present budget is indeed greater than the total federal budget in 1957. In the fiscal year beginning July 1, 1969, the Pentagon will spend about 82 billion dollars, or 40 per cent of the federal budget. Health and welfare will spend about 5.5 billion, or 27.2 percent, while community development and housing will spend 2.8 billion, or 1.4 per cent. Beyond that inequity is the self-perpetuating character of the Pentagon. Its officer elite is of course subject to some controls; but those controls are mostly formal. The Pentagon has a magnetism and energy of its own. It exercises, moreover, a powerful impact on the public mind. A phone call or a personal visit by the Pentagon propels its numerous public spokesmen into action. On Capitol Hill it maintains one public relations man for every two or three Congressmen and Senators. The mass media-essentially the voice of the Establishment-much of the time reflects the mood of the Pentagon and the causes which the military-industrial complex espouses. So, we the people are relentlessly pushed in the direction that the Pentagon desires. The push in that direction is increased by powerful foreign interests. The China Lobby, financed by the millions extorted and extracted from America by the Kuomintang, uses vast sums to brainwash us about Asia. The Shah of Iran hires Madison Avenue advertising houses to give a democratic luster to his military, repressive dictatorship. And so it goes. Secrecy about the crucial facts concerning Soviet or Chinese plans is the Pentagon's most powerful weapon. No one without that knowledge is qualified to speak. That knowledge cannot be made public, as it involves matters of national security. Senior members of the armed services are in the know; so are their industrial allies and their scientific allies; so are members of the Armed Services Committee of Congress. This is indeed a small club that holds all the secrets and therefore has the only qualifications to make the crucial decisions. This kind of prestigious club exerts a powerful influence. Its members are so potent that they can-and do-exclude critics or skeptics as security risks. So we sail off into the nuclear sunset under orders of those who think only in terms of death. We have perhaps put into words the worries and concerns of modern youth. Their wisdom is often instinctive; or they may acquire a revealing insight from gross statements made by their elders. But part of their overwhelming fear is the prospect of the military regime that has ruled us since the Truman administrations and of the ominous threat that the picture holds. Is our destiny to kill Russians? to kill Chinese? Why cannot we work at cooperative schemes and search for the common ground binding all mankind together? Yet another major source of disaffection among our youth stems from the reckless way in which the Establishment has despoiled the earth. At the present rate of the use of oxygen in the air, it may not be long until there is not enough for people to breathe. The percentage of carbon dioxide in some areas is already dangerously high. Sunshine and the green leaves may not be able to make up the growing deficiency of oxygen which exists only in a thin belt around the earth. Everyone knows-including the youthful dissenters-that Lake Erie is now only a tub filled with stinking sewage and wastes. Many of our rivers are open sewers. Our estuaries are fast being either destroyed by construction projects or poisoned by pollution. Yet these estuaries are essential breeding grounds for marine life: eighty per cent of the fish, shrimp, crabs, and the like spend a critical period of their lives in some estuary. Virgin stands of timber are virtually gone. Only remnants of the once immortal redwoods remain. Pesticides have killed millions of birds, putting some of them in line for extinction. DDT, now in dangerous solution in our oceans, causes birds to produce eggs with shells too fragile for nesting. That is why the Bermuda petrel, peregrine osprey and brown pelican are doomed to extinction. DDT makes female fish sterile. Along the Atlantic coast commercial fish are reproducing at an alarmingly low rate. Hundreds of trout streams have been destroyed by highway engineers and their faulty plans. The wilderness disappears each year under the ravages of bulldozers, highway builders, and men in search of metals that will make them rich. Our coastlines are being ruined by men who search for oil yet have not mastered the technology enough to know how to protect the public interest in the process. Youthful dissenters are not experts in these matters. But when they see all the wonders of nature being ruined they ask, "What natural law gives the Establishment the right to ruin the rivers, the lakes, the ocean, the beaches, and even the air?" Their protest is not only against what the Establishment is doing to the earth but against the callous attitude of those who claim the God-given right to wreak that damage on the nation without rectifying the wrong. p53An American GI in Vietnam wrote me in early 1969, stating that bald truth: "Somewhere I in our history-though not intentionally-we slowly moved from a government of the people to a government of a chosen few . . . who, either by birth, family tradition or social standing-a minority possessing all the wealth and power- now . . . control the destiny of mankind." This GI ended by saying, "You see, Mr. Douglas, the greatest cause of alienation is that my generation has no one to turn to." And he added, "With all the hatred and violence that exist throughout the world it is time someone, regardless of personal risk, must stand up and represent the feelings, the hopes, the dreams, the visions and desires of the hundreds of thousands of Americans who died, are dying, and will die in the search of truth." "The pervasive and insistent disquiet on many campuses throughout the nation indicates that unrest results, not from a conspiracy by a few, but from a shared sense that the nation has no adequate plans for meeting the crises of our society.... We do not say that all of the problems faced by colleges and universities are a reflection of the malaise of the larger society. That is not true. But we do say that until political leadership addresses itself to the major problems of our society-the huge expenditure of national resources for military purposes ... the critical needs of America's ... poor, the unequal division of our life on racial issues - until this happens, the concern and energy of those who know the need for change will seek outlets for their frustration." The truth is that a vast restructuring of our society is needed if remedies are to become available to the average person. Without that restructuring the good will that holds society together will be slowly dissipated. We are witnessing, I think, a new American phenomenon. The two parties have become almost indistinguishable; and each is controlled by the Establishment. The modern day dissenters and protesters are functioning as the loyal opposition functions in England. They are the mounting voice of political opposition to the status quo, calling for revolutionary changes in our institutions. The streets of our country are in turmoil. The universities are filled with students rebelling and rioting. Communists are seeking to destroy our country. Russia is threatening us with her might and the republic is in danger. Yes, danger from within and without. We need law and order. General David M. Shoup of the Marines has called the Pentagon and the defense industry "a powerful public opinion lobby." War has become to American civilians "an exciting adventure, a competitive game, and an escape from the dull routine of peacetime." p68If history is a guide, the powers-that-be will not respond until there are great crises, for those in power are blind devotees to private enterprise. They accept that degree of socialism implicit in the vast subsidies to the military-industrial complex, but not that type of socialism which maintains public projects for the disemployed and the unemployed alike. I believe it was Charles Adams who described our upside down welfare state as "socialism for the rich, free enterprise for the poor." The great welfare scandal of the age concerns the dole we give rich people. Percentage depletion for oil interests is, of course, the most notorious. But there are others. Any tax deduction is in reality a "tax expenditure," for it means that on the average the Treasury pays 52 per cent of the deduction. When we get deeply into the subject we learn that the cost of public housing for the poorest twenty per cent of the people is picayune compared to federal subsidy of the housing costs of the wealthiest twenty per cent. Thus, for 1962, Alvin Schoor in Explorations in Social Policy, computed that, while we spent 870 million dollars on housing for the poor, the tax deductions for the top twenty per cent amounted to 1.7 billion dollars. And the 1968 Report of the National Commission on Civil Disorder tells us that during a thirty-year period when the federal government was subsidizing 650,000 units of low-cost housing, it provided invisible supports, such as cheap credit and tax deductions, for the construction of more than 10 million units of middle- and upper-class housing. The big corporate farmer who has varied business interests has a large advantage over the small farmer. The farm corporation can write off profits from non-farm enterprises against farm losses. Moreover, it gets a low capital gains rate of tax in situations such as the following: a corporation buys cattle and keeps them for several years, taking the maintenance costs as a farming loss and thereby reducing its profits from other sources. Then it sells the herd and any profit on the sale is taxed at 25 per cent. Like examples are numerous in our tax laws, each marking a victory for some powerful lobby. The upside down welfare state helps the rich get richer and the poor, poorer. Other subsidies receive a greater reverence. Railroads, airlines, shipping-these are all subsidized; and those companies' doors are not kicked down by the police at night. Publishers get a handsome subsidy in the form of low second-class mail rates, and publishers' rights are meticulously honored. The subsidies given farmers are treated, not as gratuities, but as matters of entitlement. The airspace used by radio and TV is public property. But the permittees are not charged for the use of it. Of all these only the welfare recipient is singled out for degrading supervision and control. In some parts of the world the choice is between peaceful revolution and violent revolution to get rid of an unbearable yoke on the backs of people, either religious, military, or economic. The Melville account from Guatemala is in point. Thomas R. Melville and Arthur Melville are twins and Marian P. Bradford, a nun, who later married Thomas. These three worked primarily among the Indians who make up about 56 per cent of the population of Guatemala. They saw the status quo, solidly aligned against the Indians, being financed by our Alliance For Progress and endowed with secret intelligence service to ferret out all "social disturbers." "Having come to the conclusion that the actual state of violence, composed of the malnutrition, ignorance, sickness and hunger of the vast majority of the Guatemalan population, is the direct result of a capitalistic system that makes the defenseless Indian compete against the powerful and well-armed landowner, my brother and I decided not to be silent accomplices of the mass murder that this system generates. We began teaching the Indians that no one will defend their rights if they do not defend them themselves. If the government and oligarchy are using arms to maintain them in their position of misery, then they have the obligation to take up arms and defend their God-given right to be men. Their final conclusion was "Our response to the present situation is not because we have read either Marx or Lenin, but because we have read the New Testament." That is also what Dom Helder Camara, Archbishop of Recife. Brazil, was telling the world in 1969. "My vocation," he said, "is to argue, argue, argue for moral pressure upon the lords." The "lords" are the "slave-masters"--the Establishment in Brazil and the United States, now dedicated to crushing any move towards violent upheaval. Though violence is not open to Archbishop Camara, he said, "I respect the option for violence." Guatemala and Brazil are token feudal situations characteristic of the whole world. They represent a status quo that must be abolished. First: The welfare program works in reverse by siphoning off billions of dollars to the rich and leaving millions of people hungry and other millions feeling the sting of discrimination. Second: The special interests that control government use its powers to favor themselves and to perpetuate regimes of oppression, exploitation, and discrimination against the many. There are only two choices: A police state in which all dissent is suppressed or rigidly controlled; or a society where law is responsive to human needs. If society is to be responsive to human needs, a vast restructuring of our laws is essential. We know by now that we make technology the predestined force in our lives, man will walk to the measure of its demands. We know how leveling that influence can be, how easy it is to computerize man and make him a servile thing in a vast industrial complex. This means we must subject the machine- technology-to control and cease despoiling the earth and filling people with goodies merely to make money. The search of the young today is more specific than the ancient search for the Holy Grail. The search of the youth today is for ways and means to make the machine-and the vast bureaucracy of the corporation state and of government that runs that machine-the servant of man. That is the revolution that is coming. That revolution-now that the people hold the residual powers of government-need not be a repetition of 1776. It could be a revolution in the nature of an explosive political regeneration. I consider these earleir posts and the RECTO READER as essential in knowing and understanding our homeland and ourselves, native, Malay Filipinos; and are therefore always presented in each new post. Click each to open/read. THE FILIPINO MIND blog contains 532 published postings you can view, as of December 12, 2012. The postings are oftentimes long and a few readers have claimed being "burnt out." My apologies. The selected topics are not for entertainment but to stimulate deep, serious thoughts per my MISSION Statement and hopefully to rock our boat of ignorance, apathy, complacency and hopefully lead to active citizenship. All comments are welcomed for posting at the bottom window. Comments sent by email will also be posted verbatim. However, ANONYMOUS COMMENTS WILL BE IGNORED. Some postings and other relevant events are now featured in Google+, BMD_Facebook, BMD_Twitter and BMD_Google Buzz and Google+. Translate to your own language. Go to the sidebar and Click on GOOGLE TRANSLATOR (56 languages - copy and paste sentences, paragraphs and whole articles, Google translates a whole posting in seconds, including to Filipino!!). Forwarding the posts to relatives and friends, ESPECIALLY in the homeland, is greatly appreciated. Use emails, Twitter, Google+, Facebook, etc. THANK YOU !!! I guess in a country of poverty it will always be “natural” (or habitual) for people to be corrupt and ensure the security of their progeny… they are the ones giving activism a bad name…. These days people usually whine that activists aren’t doing anything except be a nuisance to traffic during their rallies… but personally I still love seeing (and even going to, when my time permits) rallies cuz I have hope, somehow, that there are still people out there who are doing something about their beliefs (no matter how naïve they are) rather than whining endlessly about it. p.s the wonderful activists that inspire me are usually those who prefer to hide, the unsung heroes who truly make a difference in people’s lives, no matter how small they are… even though they won’t get anything from it… people who truly believe and ACT on the fact that humanity deserves something better.. anybody who believes in a just and free society is my comrade!!!! Thanks for your response. As you alluded to, the socioeconomic and political conditions in our homeland is enragingly frustrating; the despair and apathy of the natives are understandable. As long as we have not forged ourselves with nationalism, we as a people will continually be atomizing and drifting at our expense, in the present and future generations. While foreigners and their local partners are taking advantage of such disunity by "owning" us, our territory and our national patrimony. It is an extremely difficult job to stem the destructive effects of globalization (economic and cultural)and since we Filipinos have been "globalized" many decades before the 1995 WTO. But one can do something towards that end, if one so desires to study and act in one's own little way, to inform others and fight for Filipino nationalism. 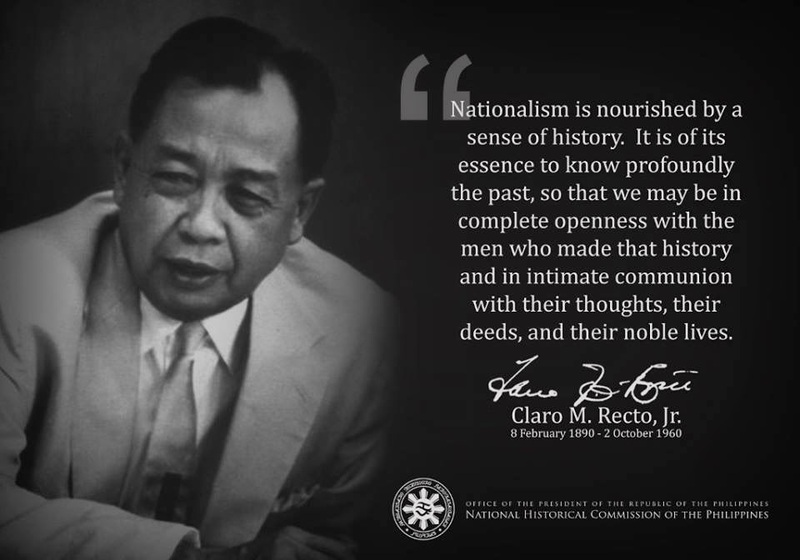 For nationalism by the native majority (Malay Filipinos) is the prerequisite attitude and behavior, the sine qua non for the attainment of the common good whether through communism, neoliberalism, or democratic socialism (Scandinavian model). Note that nationalism is anathema to both Marxist-Leninist communism and neoliberalism/globalism. You really have a great bLogspot theRe and the articles you post are much truly insiGHTfuL! 0ne time I'd really read thru all y0ur previ0us posts!